EUGENE — The last time we saw the Oregon men's basketball team in action, Marquette was scoring 101 points to send Ducks out of the NIT. Giving up 101 points was an appropriate conclusion to a season that didn't go as planned for a program that expected more than 23-13 on the heels of its 2017 Final Four appearance. Last season's Ducks, with only one regular contributor back from 2016-17, never found their footing — especially on defense. "Our transition 'D' last year wasn't good," Oregon coach Dana Altman says. "At times, our defense on 3-pointers was not good. Our activity, our deflections were way down. So we as a coaching staff and as a team didn't have a good year defensively. And it cost us. "We should have had a better defensive team." The Ducks are about to start fresh. After a Nov. 1 exhibition against Western Oregon, they will play Nov. 6, when Portland State brings its high-tempo game to Matthew Knight Arena. That's the first of eight nonconference home games before UO's Pac-12 play begins Jan. 5 at home against Oregon State. For the second year in a row, Altman and his staff must acclimate a significant group of new players to their program. Oregon lost three of its top four scorers, with Elijah Brown and MiKyle McIntosh graduating and Troy Brown Jr. leaving for the NBA. But expectations will be high thanks to a group of newcomers that includes five freshmen ranked among the top 100 recruits in the country. 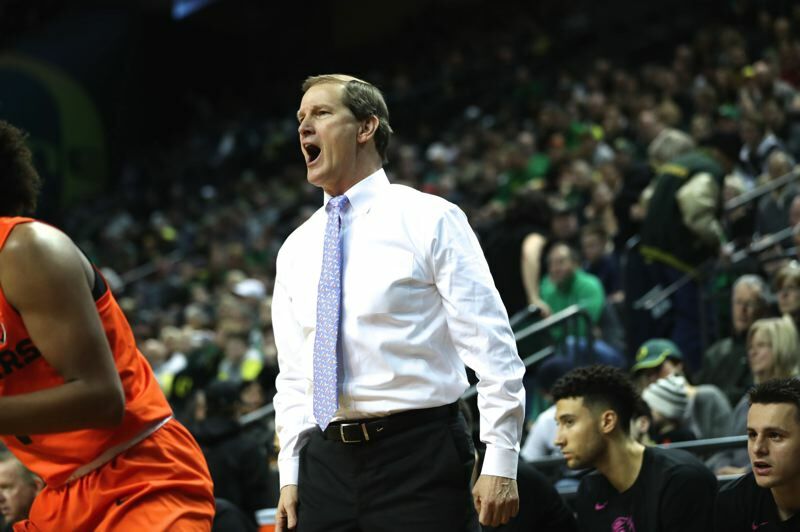 The spotlight is certain to be bright upon 7-2 Bol Bol, the highest-rated recruit in Ducks basketball history, and his four talented classmates: 6-9 forward Louis King, 6-10 forward Miles Norris, 6-9 forward Francis Okoro and 6-5 guard Will Richardson. The addition of senior 6-2 guard Ehab Amin, a graduate transfer who led the nation in steals per game last season at Texas A&M-Corpus Christi, adds experience to the backcourt. At least the six arriving players this year have several experienced teammates to guide them, something last year's newcomers could have used. Junior guard Payton Pritchard enters his third season as the most seasoned Duck. Pritchard says he is ready to take his game to another level and help lead the Ducks back to elite status. The 6-2 guard's sophomore season was "undervalued," according to Altman. The West Linn High grad started all 36 games and averaged 14.5 points while making 41.3 percent of his 3-pointers. Pritchard had 2.25 assists for every turnover. Physical development was a focus of Pritchard's offseason. He wants to finish stronger at the basket, for one thing. "Just being able to get to spots faster and get to the free-throw line. All that has to do with more athleticism," Pritchard says. Especially early in the season, when the Ducks have four challenging road trips, Pritchard will need to deliver. "He's really trying to give the team everything it needs: defensively, some vocal leadership, he's sticking his nose in on the boards, he's trying to move the ball around, he's trying to look for his opportunities," Altman says. "He's had a real good offseason, and we're going to depend on him." If Pritchard is the best known of the returning Ducks, 6-9 senior Paul White might be the most important. White played his first two seasons at Georgetown. In his first season with the Ducks, he started 24 games and averaged 9.4 points and 3.5 rebounds. "We need his experience in a lot of different roles," Altman says. "He's versatile. He can play a lot of different roles for us," including handling the ball, defending on the perimeter and contributing on the boards. One bright spot in an inconsistent defensive season last year was Kenny Wooten's presence around the rim. As a freshman, the 6-9 forward led the Pac-12 in blocked shots with 92 (2.6 per game). He also set a program record by making 68 percent of his shots from the field, but will look to be more of a factor on offense than last season, when he averaged 6.4 points. "His (shooting) form looks pretty good. His offense has really improved," Altman says. "I don't think he'll be a dominant offensive player. But he's someone we can throw it to in the post, and get good results." Wooten says he had to learn how to eat right to maintain strength through the long college season. "I feel a lot stronger," he says. "Last year, I couldn't really adjust to running all the time. I was losing a lot of weight." Sophomores Victor Bailey Jr. and Abu Kijab also will look to increase their roles and productivity in their second Oregon season. A 6-4 guard, the athletic Bailey averaged 6.7 points and 16 minutes off the bench. A 6-7 forward, Kigab played 35 games, mostly as a defender off the bench. Bol, a likely one-and-done making a stop at Oregon on his way to the NBA, should make this team interesting. The son of the late 7-6 Manute Bol, Bol Bol was considered one of the top five recruits in the country and the top center available. When Bol is on the floor with Wooten, the Ducks will have a shot-blocking tandem reminiscent of Jordan Bell and Chris Boucher. "They could definitely be like Bell and Boucher," Pritchard says. "I've challenged them to be better because I think they can. If they can be (like) those guys, then we'll be OK."
With their length on the perimeter and size around the basket, the Ducks have the physical tools to play game-defining defense. Wooten predicts that the defense will generate offense. "We're a lot lengthier than last year. It shows. I feel like we're going to be able to run the floor a lot," he says. "And I feel like we're going to be able to get a lot of steals and a lot of blocks. "It's going to be a show." Offensively, Bol — projected as at least a top-five pick, assuming he declares for next year's NBA draft — likes to play facing the basket. He is comfortable on the perimeter and handling the ball. "He's worked really hard. He's trying to figure out a way to help our team," Altman says. "We could really use him on the defensive end, the boards. He is very talented. "Finding ways to use him offensively is going to be a challenge for our staff, just to keep that floor spread with him and Kenny or him and Francis" on the floor together. Okoro, a late addition to the freshman class when he reclassified from a 2019 graduate to 2018, is expected to supply muscle inside. "We battle each other every day in practice," Wooten says. "It's hard. He is a very strong guy, and practice has amped up a lot since he's been here." The wild card for the Ducks is King. A five-star recruit from New Jersey, the small forward is still working his way back from a knee injury that ended his high school season in January. King is not yet practicing, and Altman won't say when he might start. Pritchard says King's teammates want him to take his time. "We don't want to force him to come back when he's not ready. He needs to be full go. He doesn't need to be half speed," Pritchard says. "By the time he comes back, we're going to want to be hitting our stride." Having five players back who contributed last season and who understand the program and the demands of a college season makes this transition somewhat smoother than a year ago, when Pritchard was the lone returning contributor and the Ducks struggled to find consistency. "I'm excited about those five guys leading us," Altman says. "We're going to have to get a lot of contributions from the new guys, but I do have a lot of confidence in those five guys." Altman says the team has been more productive in offseason workouts, including in the weight room, than it was a year ago. "That's a pretty good indication we're getting leadership, and those things usually carry over" into a season, he says. Oregon should get a good indication of its potential during a nonconference schedule highlighted by four challenging road trips. The first of those is the 2K Empire Classic at Madison Square Garden in New York City. The Ducks will face a veteran Iowa team on Nov. 15 and see either Syracuse or Connecticut the following day. December road games at Houston, Baylor and Boise State also will provide tests. Because of scheduling challenges, Oregon and Boise State will meet twice, with the Broncos visiting Eugene on Dec. 15. Pritchard says the 2K Empire Classic and challenging trips to Texas "will prepare us for where we want to get to in March and April" and keep the focus high during the monotony of October practices. Altman won't predict how quickly his ninth Ducks team might play at a level commensurate with its talent. "It basically boils down to how they adjust and how they work together," he says. "And how hard they work and how much they're willing to give up of their individual game for the betterment of the team."